Heart Disease: What is YOUR Risk? Organization and preparation are the keys to success when it comes to healthy eating. Let’s start by prepping our environment by having a clean, organized refrigerator and pantry that are filled with healthy food. This will make cooking and food prep easy and enjoyable. Let’s do this! Here are some tips on how to clean out your kitchen and know what you are looking for to succeed! 1. Get rid of any products in your fridge or pantry that contain vegetable oils (corn, soy, canola, safflower, cottonseed, sunflower seed, etc.). 2. Get rid of any products in your fridge or pantry that contain wheat, wheat gluten, or anything derived from wheat. 3. Get rid of any products in your fridge or pantry that contain sugar, high fructose corn syrup, corn syrup, rice syrup, aspartame, sucralose, Splenda, or any other unnatural sweeteners. 4.Get rid of any products in your fridge or pantry that contain processed foods. Granola bars, protein bars, frozen meals, crackers, “diet” foods or snacks, cookies, etc. If you know it’s not healthy and you shouldn’t be eating it, toss it. 5. Get rid of any GMOs; the top 10 GMOs are soy, aspartame, inorganic meat and dairy, zucchini and squash, papaya, cotton, corn, canola, alfalfa and sugar from sugar beets. If any of these are in your fridge or pantry and are inorganic, they are likely genetically modified. 6. Get rid of products with ingredients you don’t recognize or cannot pronounce. Again, if it is unfamiliar if you can’t pronounce it, if it is over ten letters long, if a product has more than 5-10 ingredients, if it looks like it may have been developed in a lab – get rid of it! Take Everything out of the freezer. Wipe out the entire freezer including all shelves and ice maker. Throw away anything that is expired or has freezer burn. Toss out fruit and veggies with added sugar or sauces, canned juices, baked products, frozen dinners and sweet treats. Take everything out of the fridge. Wipe out entire fridge including shelves and drawers. Throw away all items that are expired. Toss out condiments with sugar or artificial sweeteners, bread, tortillas, juice, any beverage with artificial sweeteners or sugar, dairy, packaged treats, jam/jelly, processed meats. Take everything out of the pantry. Throw away items that are expired. Toss out products with artificial sweeteners or sugar, processed syrup, flour, sugar, salt, vegetable and canola oil, boxed cereal, instant oatmeal, pasta, cornmeal, instant potatoes, packaged snacks, candy, chocolate, baking mixes. 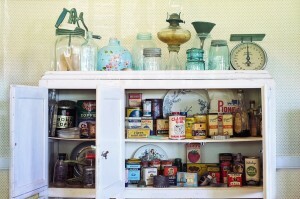 Complete the kitchen and pantry clean out as listed above. Plan your next grocery shopping trip to stock up your house with healthy nutritious options!